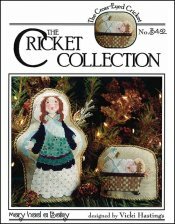 CC342: Mary Had A Baby [W6930] - $9.00 : Yarn Tree, Your wholesale source for cross stitch supplies. Cross stitch pattern by Cross Eyed Cricket. Adding to your Christmas decor, Cross-Eyed Cricket has created for you, a stand-up nativity set to add to your collection. Mary stands near baby Jesus sleeping in the manager. Stitch counts are: Mary 57W x 89H & Baby Jesus 55W x 40H.